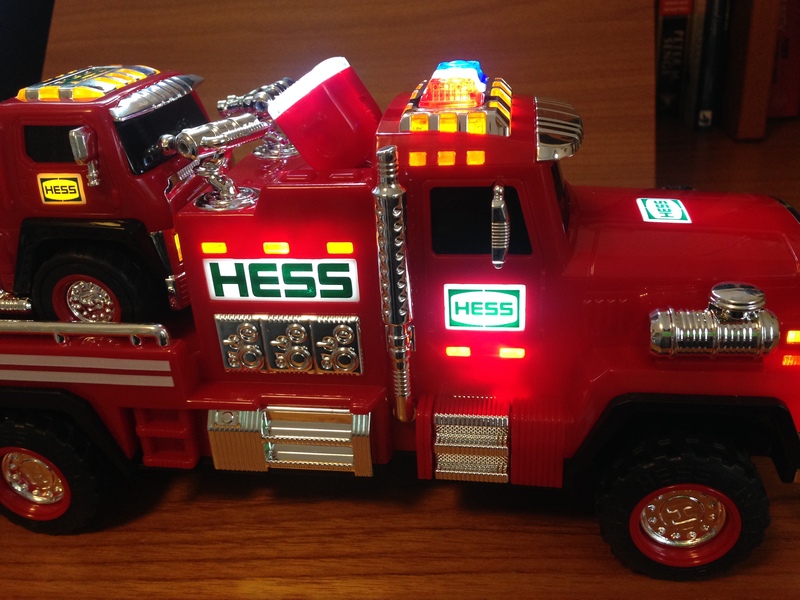 Only the Hess toy trucks at the babysitting room at our local Y have convinced our two boys to accept a drop-off there. They’re much better built and way cooler to play with than one might otherwise expect from a toy made by a gasoline station. 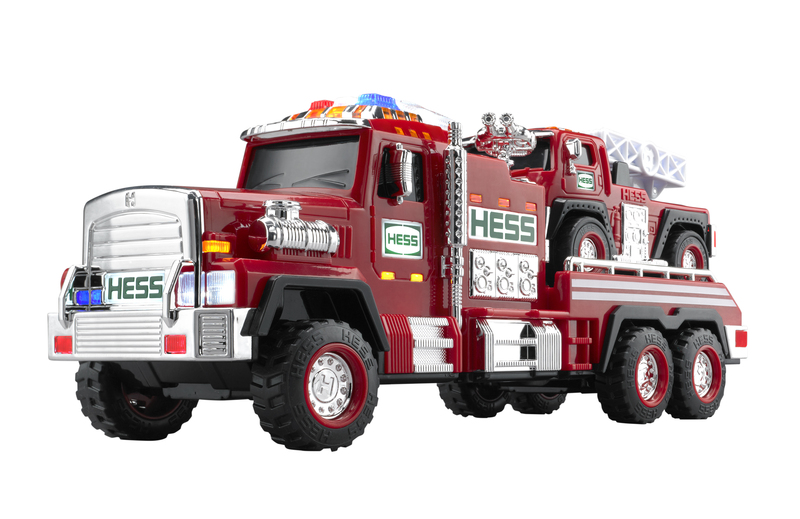 Hess, it turns out, has been producing its Toy Truck line since 1964. The first make was a tanker trailer, modeled after the ones that brought gas to the stations. For $1.29 (including batteries!) you could put the tanker trailer under the Christmas tree for your little one. You’re really getting two trucks for the price of one. Which is good, because the toy is $30.99. That’s more than most parents I know would want to spend on a truck for their kid, but it also includes free shipping and batteries. Given its high-quality construction, the truck looks like it will last a long time, so I don’t think it’s an unfair–if high–price, especially considering all its features. I got quite a start when I pulled out the ramp at the back of the larger truck–it makes a robust sound that you’d expect from a real-life mechanical ramp. It’s not the kind of annoying sound that will bug you when on repeat, but this might be a toy for kids to take out of their brother’s bedroom and into the living room when they wake up at 6:30 a.m. to play. The ramp makes for an easy entrance/exit for the Ladder Rescue truck to go do its own thing. The Fire Truck has more sounds than the ramp. There is also an Ignition button (very realistic), a Horn, and a Siren. Each sound plays for about 10 seconds and is–this is worth repeating–not something to play with while baby sister is napping. But that makes the toy all the more fun and awesome. The horn sounds like there’s a real emergency at your house. (Not to mention the siren!) If need be, you don’t have to wait 10 seconds for it to stop; you can just push the button again to silence it. (That’s a thoughtful feature!) 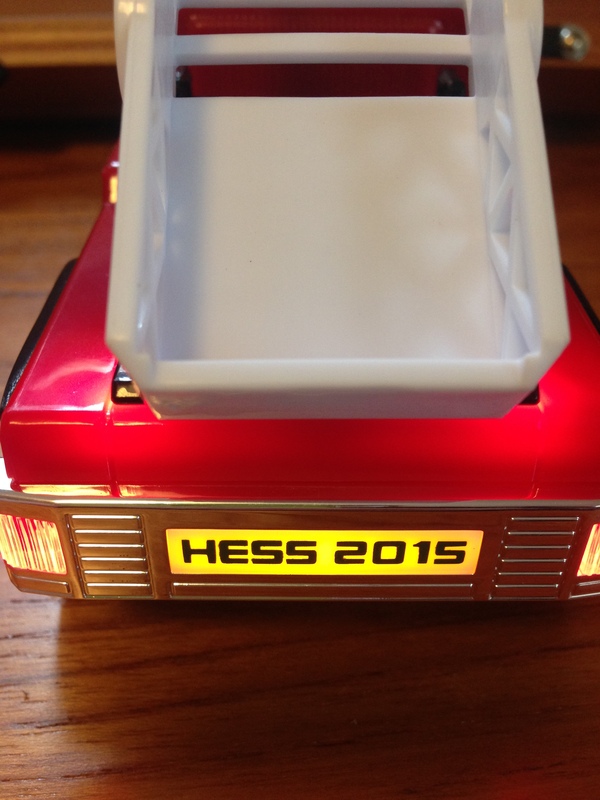 So long as your neighbors know it’s just the Hess Toy Truck and don’t go calling 9-1-1 on you, you’ll be fine. You can turn just the lights on via the switch under the truck. There are two options: you can have the lights solidly on, or turn them on in flasher mode. Regardless of what you do at the bottom of the truck, turning on any sounds causes the lights to flash. There’s also a button on top of the truck that turns just the spotlight on. The wheels are on both trucks really securely, so you can run them across the kitchen floor at full speed and not worry about it running into the fridge. It’s a smooth ride. 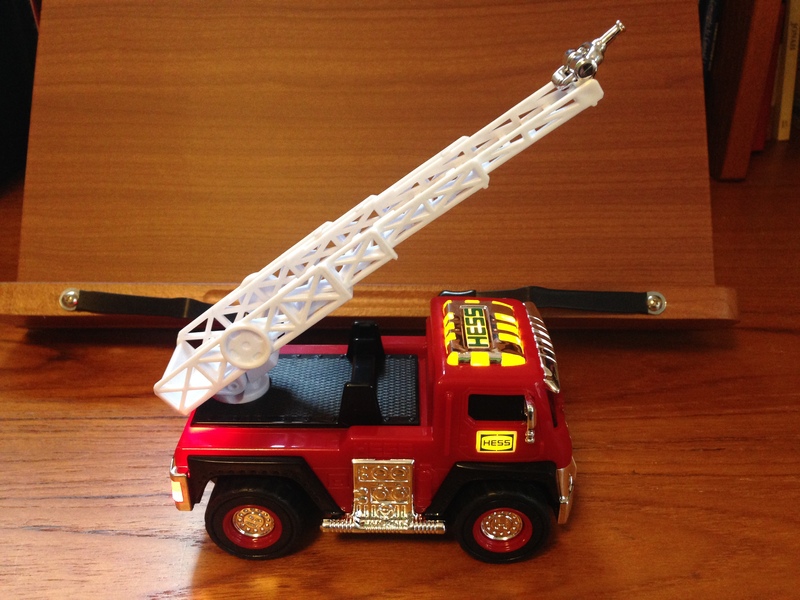 The smaller Ladder Rescue truck is fun in its own right. It’s got a fully extendable plastic ladder with a small water spout (not real!) on the end. Both trucks are sturdy and made of hard, solid plastic. The trim pieces (mirrors, ladder hose, front visors) feel a little flimsier than one might hope, but it would take a child’s deliberate act to break anything here. (Not outside the realm of possibility.) The ladder swivels a full 360 degrees and can be snapped into place when not extended. The Ladder Rescue truck also lights up via an on/off switch on the bottom of the truck. What this means for parents is that your child will turn off all the lights and find the darkest place in the house right away, so as to test the truck properly. 🙂 Parents will also want to make sure to turn the toy off at night so as to not let the batteries drain. You can’t open the doors to either truck, so your LEGO minifigures will have to latch on somewhere else, but there is plenty of room for them to hop on and go fight fires. This is really an awesome toy, and the more I played with it (yes, I played with it), the more I enjoyed it. Hours of countless fun for children are inevitable. Both trucks are thoughtfully designed and excellently executed. And the Fire Truck is pretty giant as far as children’s toy vehicles go, so you could do well to make this the “big” present you’re getting your child(ren) this Christmas. 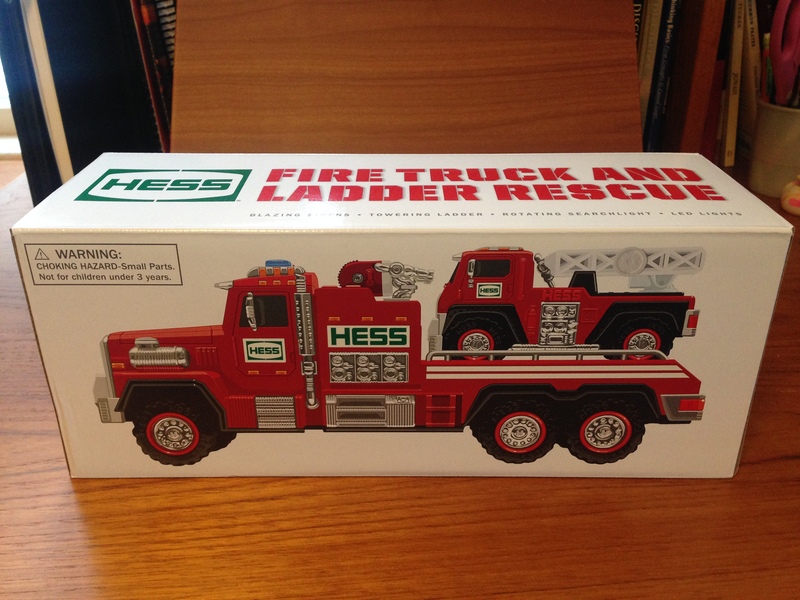 One other cool thing: Hess has made 100 individually numbered Silver Editions of the Fire Truck and Ladder Rescue toy. I got the expected red one and was not disappointed. You find out more and purchase the truck here. 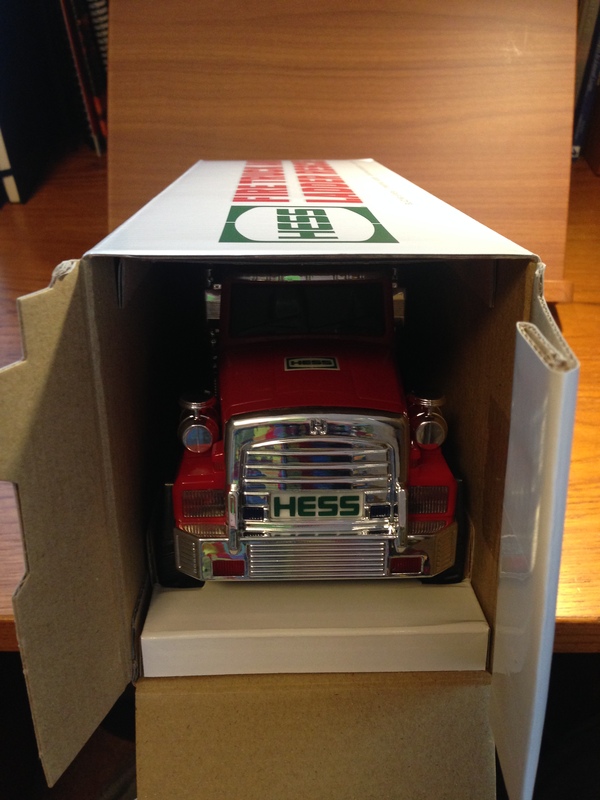 You can find the Hess Toy Truck on social media (#2015HessToyTruck) here: Facebook/Twitter/Instagram. Many thanks to the fine folks doing PR for Hess who set me up with the free product sample for review, with no expectations as the the review’s content. Kids loved them but I was disappointed that they were plastic this year. I prefer the metal ones. Thanks for your comment! Don’t know if I’ve seen any metal ones up close… when were they made? I don’t know. Maybe to promote the truck in its own right? Interesting question.